UK digital ad spend reached an estimated £7.2bn in 2014 according to the Internet Advertising Bureau (IAB) up from £6.3bn in the previous year. Yet despite years of inflation-beating growth the industry faces a threat – one that many may say is a result of the sector’s own complacency and disregard for consumers. It’s been the topic of an increasing number of industry discussions and roundtable events held in recent months. The threat? Users blocking ads. The rise of the more savvy surfer has led to an increase in the number of web users opting to avoid advertisements online through the use browser plugins specifically designed to filter out advertisements from consumed content. How widespread is the use of Adblockers? Figures for the proportion of consumers utilising ad blocking solutions vary, but publishers, networks and industry bodies all appear to agree that usage is increasing – and rapidly. In the UK the IAB’s latest research from February 2016 shows that 22% of British adults currently use an ad-blocking solution, up from 18% just four months earlier. UK ad blocking grew 82% to reach 12 million active users in the year to June 2015 according to PageFair, one of a growing number of platforms that provide a way for publishers to fight back. The ad network, strapline “we help websites survive the rise of Adblock”, offers to replace blocked ads on partners websites with “non-intrusive” ads and enables publishers to recapture revenue lost to blocking. The proliferation of ad blockers amongst internet users varies considerably by sector. With Quartz reporting that usage figures range from 30%-90% of visitors blocking ads to a selection of individual sites. Significant ad blocking has now made the jump over to mobile in a big way. With mobile now accounting for greater than 50% of sessions, any publisher hopes of this continuing shift offering a way to recoup revenue from users with desktop blockers are now evaporating. In September last year Apple released iOS 9 which for the first time enabled Safari content blocking apps to enter their App Store. In less than day ad blocking apps had shot up the app charts and penetration rates are approaching those on desktop. Things could be about to get worse. Citing concerns over consumer experience, privacy and increased data charges, the mobile network Three is planning to roll out a solution which can block 95% of banner and pop-up ads served to its 8.8 million subscribers. Perhaps even more alarming for those relying on an ad-funded model are that the figures suggest rates of adblocking are greatest amongst the young and those in emerging markets, growing a whole new generation of internet users who expect the web to be ad free. The number one browser in most Asian markets is UC Browser which is owned by the e-commerce giant Alibaba. With a 51% market share in India, ads are blocked as standard. Blocking ads is nothing new. Opting to improve your browsing experience by restricting the intrusion of online advertisements has happened for years. Pop-ups and pop-unders were the scourge of the internet in the late 1990s. The most popular browsers came with built-in pop-up blocking as standard in the early 2000s and the medium virtually died out. Advertisers and publishers responded with new formats. Our ads have evolved to become increasingly personalised and online video ad spend is growing at 40-50% a year. So Why Are Users Blocking Ads? Since switching to using Chrome as my primary browser shortly after its release, I had for several years browsed perfectly harmoniously consuming ads alongside my content. Yes – there were occasionally irritating ads – autoplay video ads on sports sites being the worst – but the majority weren’t too obnoxious and I didn’t have an issue with them at all. That changed in early-2015 when YouTube began to subject me to an increasing proportion of pre-roll video ads, not just the 5 second click-to-skip ads but also “non-skippable in-stream ads”, before I was able to access the content I requested. I’m not alone. The IAB report cites an interrupted experience as the top reason people chose to block ads. It’s much easier to install an ad-blocking plugin and leave the default settings rather than configure the options to block just the most irritating ads. So sadly the smaller publishers who rely on less-intrusive banners are hit too. Some of the most popular ad-blocking solutions aren’t actually a catch-all. By default when Adblock Plus is installed “Acceptable Ads” are shown in the browser. Providing advertisements on a website meet certain criteria, effectively are less intrusive, the publisher applies to be whitelisted and passes a review process, ads can become enabled again by default to Adblock Plus users. This seems like a fair balance to me. A quick look at the list of Acceptable Ad exception rules immediately shows the presence of some of the largest brands. At the time of writing, “Google” shows up in the list 3,833 times. This is where the adblocking revenue model comes in. Whilst Acceptable Ad-compliant small publishers can appear on the whitelist for free, any publisher that will serve “10 million additional ad impressions per month due to participation in the Acceptable Ads initiative” is billed “30 percent of the additional revenue created by whitelisting its acceptable ads”. How are publishers dealing with the threat? In addition to the two most obvious approaches, “they aren’t” and making their ads “acceptable”, publishers are trying different methods to combat ad blocking users. 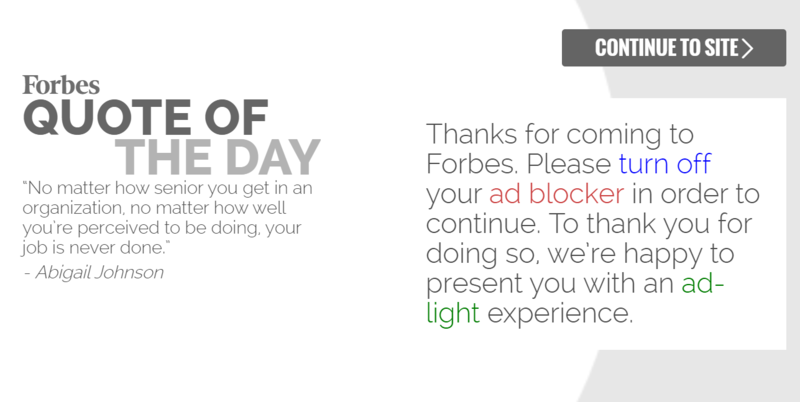 Splash-page loving Forbes say 13% of their visitors have installed an ad blocking solution. Since mid-December 2015 the site has blocked “a small percentage of those with ad blockers” from accessing their content. A nag screen on their experience-interrupting splash screen demands that users switch off their ad blocker to access the site in exchange for 30 days of “less intrusive” advertising. 42% of users did disable Adblock when asked, enabling Forbes to serve an additional 15 million impressions which would otherwise have been blocked. 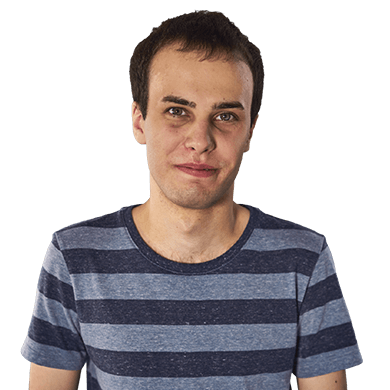 Lewis DVorkin wrote an interesting article sharing some details of the test on the site (who knows if you’ll get to access his article if you have adblock enabled…). 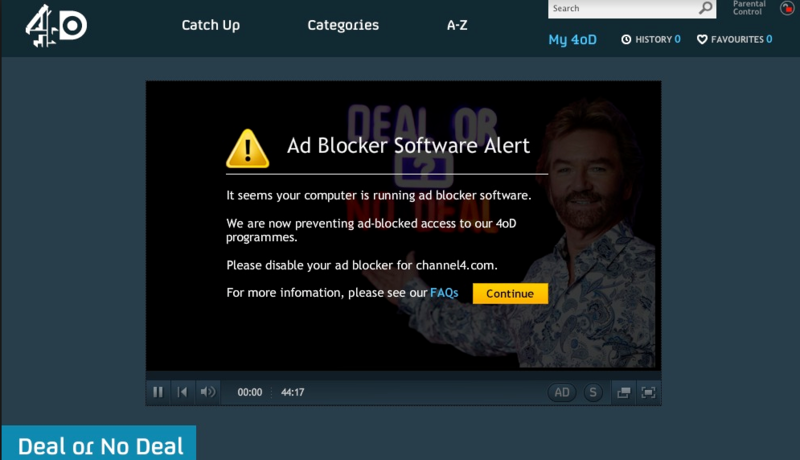 Channel 4’s live streaming and video on demand services make use of pre and in-video advertisements as well as surrounding banners and block users of Adblock software from playing videos. The number of sites employing such a solution has increased noticeably since late 2015 with news publishers sites such as CityAM also employing such measures. Whatever your thoughts on adblocking this surely counts as cloaking and should be penalised? With consumer use of Adblock followed by publisher use of Adblock Blocker technology, it was surely only a matter of time before an anti-Adblock killer inevitably appeared on the scene. This game of cat and mouse is perhaps best seen with the EasyList community which provides a list of ad-blocking filters which users can subscribe to ensuring they block the most recent ads. Its forum for users to report unblocked ads has 15,000 topics. As publishers increasingly restrict access to those using Adblock, the ad blocking technology gets smarter at circumventing such behaviour. German publisher Axel Springer took the makers of Adblock Plus, Eyeo, to court claiming that the software “breached laws on competition, copyright or market dominance”. They lost. Others take a more softly-softly approach with messages informing users that their use of ad-blocking technology is preventing the site from monetizing its content. The Guardian suggests “perhaps you’ll support us another way?” to browsers who aren’t seeing ads, pushing their paid for Supporter membership. Although the Android and iOS app stores allow apps which enable in-browser ad blocking, both are opposed to those which target in-app ads citing privacy concerns. So, for now at least, pushing users towards apps may offer at least a temporary reprieve. The Paywall model is notoriously hard to work for general publishers when equivalent content is available elsewhere for free. However, some publishers have begun to offer an ad-free subscription model. For example Google have launched YouTube Red. Currently only available in the US, this offers ad-free browsing of videos plus some additional features for $10 a month. Consumers are losing from the current proliferation of ads and increasingly intrusive formats. Publishers are losing from the growth of Adblock, journalism and content needs to be paid for. For now, the only winners are publishers of ad blocking software. What will be the next step in the ad-blocking war?